Bubble memory is a type of non-volatile computer memory that uses a thin film of a magnetic material to hold small magnetized areas, known as bubbles or domains, each storing one bit of data. The material is arranged to form a series of parallel tracks that the bubbles can move along under the action of an external magnetic field. The bubbles are read by moving them to the edge of the material where they can be read by a conventional magnetic pickup, and then rewritten on the far edge to keep the memory cycling through the material. In operation, bubble memories are similar to delay line memory systems. Bubble memory started out as a promising technology in the 1980s, offering memory density of a similar order to hard drives but performance more comparable to core memory. This led many to consider it a contender for a "universal memory" that could be used for all storage needs. 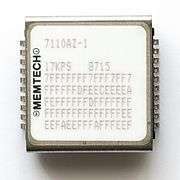 However, the introduction of dramatically faster semiconductor memory chips pushed bubble into the slow end of the scale, and equally dramatic improvements in hard drive capacity made it uncompetitive in price terms. Bubble memory was used for some time in the 1970s and 80s where its non-moving nature was desirable for maintenance or shock-proofing reasons. The introduction of Flash RAM and similar technologies rendered even this niche uncompetitive, and bubble disappeared entirely by the late 1980s. Bubble memory is largely the brainchild of a single person, Andrew Bobeck. Bobeck had worked on many kinds of magnetics-related projects through the 1960s, and two of his projects put him in a particularly good position for the development of bubble memory. The first was the development of the first magnetic core memory system driven by a transistor-based controller, and the second was the development of twistor memory. Twistor is essentially a version of core memory that replaces the "cores" with a piece of magnetic tape. The main advantage of twistor is its ability to be assembled by automated machines, as opposed to core, which was almost entirely manual. AT&T had great hopes for twistor, believing it would greatly reduce the cost of computer memory and put them in an industry leading position. Instead, DRAM memories came onto the market in the early 1970s that rapidly replaced all previous random access memory systems. Twistor ended up being used only in a few applications, many of them AT&T's own computers. One interesting side-effect of the twistor concept was noticed in production; under certain conditions, passing a current through one of the electrical wires running inside the tape would cause the magnetic fields on the tape to move in the direction of the current. 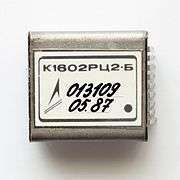 If used properly, it allowed the stored bits to be pushed down the tape and pop off the end, forming a type of delay line memory, but one where the propagation of the fields was under computer control, as opposed to automatically advancing at a set rate defined by the materials used. However, such a system had few advantages over twistor, especially as it did not allow random access. In 1967, Bobeck joined a team at Bell Labs and started work on improving twistor. He thought that if he could find a material that allowed the movement of the fields easily in only one direction, a strip of such material could have a number of read/write heads positioned along its edge instead of only one. Patterns would be introduced at one edge of the material and pushed along just as in twistor, but since they could be moved in one direction only, they would naturally form "tracks" across the surface, increasing the areal density. This would produce a sort of "2D twistor". Paul Charles Michaelis working with permalloy magnetic thin films discovered that it was possible to propagate magnetic domains in orthogonal directions within the film. This seminal work led to a patent application. The memory device and method of propagation were described in a paper presented at the 13th Annual Conference on Magnetism and Magnetic Materials, Boston, Massachusetts, September 15, 1967. The device used anisotropic thin magnetic films that required different magnetic pulse combinations for orthogonal propagation directions. The propagation velocity was also dependent on the hard and easy magnetic axes. This difference suggested that an isotropic magnetic medium would be desirable. Starting work extending this concept using orthoferrite, Bobeck noticed an additional interesting effect. With the magnetic tape materials used in twistor the data had to be stored on relatively large patches known as "domains". Attempts to magnetize smaller areas would fail. With orthoferrite, if the patch was written and then a magnetic field was applied to the entire material, the patch would shrink down into a tiny circle, which he called a bubble. These bubbles were much smaller than the "domains" of normal media like tape, which suggested that very high area densities were possible. The bubble system cannot be described by any single invention, but in terms of the above discoveries. Andy Bobeck was the sole discoverer of (4) and (5) and co-discoverer of (2) and (3); (1) was performed by P. Michaelis in P. Bonyhard's group. At one point, over 60 scientists were working on the project at Bell Labs, many of whom have earned recognition in this field. For instance, in September 1974, H.E.D. Scovil, P.C. Michaelis and Bobeck were awarded the IEEE Morris N. Liebmann Memorial Award by the IEEE with the following citation: For the concept and development of single-walled magnetic domains (magnetic bubbles), and for recognition of their importance to memory technology. It took some time to find the perfect material, but they discovered that garnet turned out to have the right properties. Bubbles would easily form in the material and could be pushed along it fairly easily. The next problem was to make them move to the proper location where they could be read back out — twistor was a wire and there was only one place to go, but in a 2D sheet things would not be so easy. Unlike the original experiments, the garnet did not constrain the bubbles to move only in one direction, but its bubble properties were too advantageous to ignore. The solution was to imprint a pattern of tiny magnetic bars onto the surface of the garnet. When a small magnetic field was applied, they would become magnetized, and the bubbles would "stick" to one end. By then reversing the field they would be attracted to the far end, moving down the surface. Another reversal would pop them off the end of the bar to the next bar in the line. A memory device is formed by lining up tiny electromagnets at one end with detectors at the other end. Bubbles written in would be slowly pushed to the other, forming a sheet of twistors lined up beside each other. Attaching the output from the detector back to the electromagnets turns the sheet into a series of loops, which can hold the information as long as needed. Bubble memory is a non-volatile memory. Even when power was removed, the bubbles remained, just as the patterns do on the surface of a disk drive. Better yet, bubble memory devices needed no moving parts: the field that pushed the bubbles along the surface was generated electrically, whereas media like tape and disk drives required mechanical movement. Finally, because of the small size of the bubbles, the density was in theory much higher than existing magnetic storage devices. The only downside was performance; the bubbles had to cycle to the far end of the sheet before they could be read. Bubble memory by MemTech (purchaser of Intel Magnetics). Bubble memory made in the USSR. Bobeck's team soon had 1 cm (0.39 in) square memories that stored 4,096 bits, the same as a then-standard plane of core memory. This sparked considerable interest in the industry. Not only could bubble memories replace core but it seemed that they could replace tapes and disks as well. In fact, it seemed that bubble memory would soon be the only form of memory used in the vast majority of applications, with the high-performance market being the only one they could not serve. The technology was included in experimental devices from Bell Labs in 1974. By the mid-1970s, practically every large electronics company had teams working on bubble memory. Texas Instruments introduced the first commercial product that incorporated bubble memory in 1977. By the late 1970s several products were on the market, and Intel released their own 1-megabit version, the 7110. By the early 1980s, however, bubble memory technology became a dead end with the introduction of hard disk systems offering higher storage densities, higher access speeds, and lower costs. In 1981 major companies working on the technology closed their bubble memory operations. Bubble memory found uses in niche markets through the 1980s in systems needing to avoid the higher rates of mechanical failures of disk drives, and in systems operating in high vibration or harsh environments. This application became obsolete too with the development of flash memory, which also brought performance, density, and cost benefits. One application was Konami's Bubble System arcade video game system, introduced in 1984. It featured interchangeable bubble memory cartridges on a 68000-based board. The Bubble System required a "warm-up" time of about 85 seconds (prompted by a timer on the screen when switched on) before the game was loaded, as bubble memory needs to be heated to around 30 to 40 °C (86 to 104 °F) to operate properly. Sharp used bubble memory in their PC 5000 series, a laptop-like portable computer from 1983. Nicolet used bubble memory modules for saving waveforms in their Model 3091 oscilloscope, as did HP in their Model 3561 spectrum analyzer. GRiD Systems Corporation used it in their early laptops. TIE communication used it in the early development of digital phone systems in order to lower their MTBF rates and produce a non-volatile telephone system's central processor. Bubble memory was also used on the Quantel Mirage DVM8000/1 VFX system. 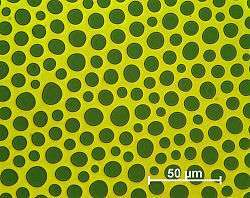 In 2007, the idea of using microfluidic bubbles as logic (rather than memory) was proposed by MIT researchers. The bubble logic would use nanotechnology and has been demonstrated to have access times of 7 ms, which is faster than the 10 ms access times that present hard drives have, though it is slower than the access time of traditional RAM and of traditional logic circuits, making the proposal not commercially practical at present. IBM's recent work on racetrack memory is essentially a 1-dimensional version of bubble, bearing an even closer relationship to the original serial twistor concept. A level in the video game Chip's Challenge was inspired by bubble memory. The car, KITT, in the television series Knight Rider uses bubble memory. It is mentioned in the series when KITT is seriously damaged and the memory needs to be reconstructed. The second half of Tom Baker's ultimate regular appearance on Doctor Who revolved around his character and a major recurring enemy reconstructing an alien program stored in bubble memory on an early 1980s Earth-based computer system. Wikimedia Commons has media related to magnetic bubble memory. ↑ "Bubble Memory — 10 Technologies that were Supposed to Blow Up but Never Did". Complex. 2012-09-25. Retrieved 2012-10-03. ↑ Stacy V. Jones (Feb 2, 1974). "Computer-Memory Aid Devised". New York Times. New York, N.Y. p. 37. ISSN 0362-4331. ↑ "Texas Instruments Introduces Portable Computer Terminal: Model Said to Be First With Mass Memory and Using Bubble Memory Device". Wall Street Journal. New York, N.Y.: Dow Jones & Company Inc. Apr 18, 1977. p. 13. ISSN 0099-9660. ↑ Banks, Howard (September 20, 1981). "The Computer Bubble That Burst". New York Times. Retrieved 17 October 2013. Look up bubble memory in Wiktionary, the free dictionary.